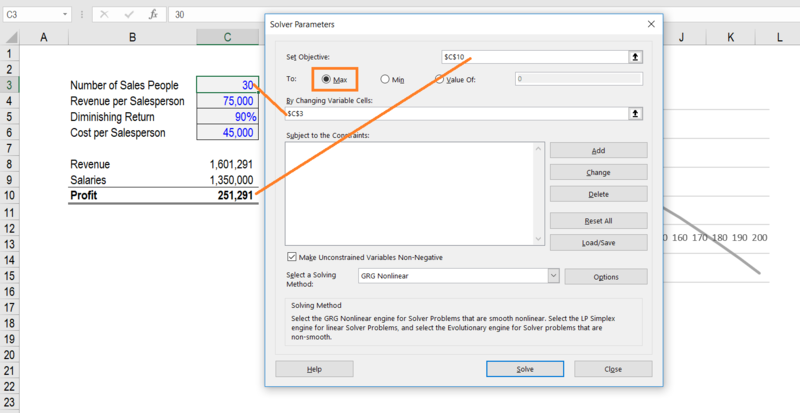 Excel Solver is an optimization tool that can be used to determine how the desired outcome can be achieved by changing the assumptions in a model. It is a type of what-if analysisDynamic Financial AnalysisThis guide will teach you how to perform dynamic financial analysis in Excel using advanced formulas and functions. INDEX, MATCH, and INDEX MATCH MATCH Functions, Combining CELL, COUNTA, MID and OFFSET in a Formula. When used, these Excel functions make your financial statement analysis more dynamic and is particularly useful when trying to determine the “best” outcome, given a set of more than two assumptions. Learn with video instruction in CFI’s Advanced Excel Course. The best example of how to use Excel solver is by graphing a situation where there is a non-linear relationship between, for example, the number of salespeople in a company and the profitGross ProfitGross profit is the direct profit left over after deducting the cost of goods sold or cost of sales from sales revenue. It's used to calculate the gross profit margin and is the initial profit figure listed on a company's income statement. Gross profit is calculated before operating profit or net profit. that they generate. There is a diminishing return on salespeople, so we want to figure out what the optimal number of people to hire is. Put another way, we want to figure out how many salespeople we should hire to get the maximum amount of profit. The first step is to make sure you have Solver installed in your Excel file. To do this, go to File -> Options -> Add-Ins -> Manage Excel Add-Ins. When the dialogue box appears, make sure the box is ticked, as shown below. Here, we’ve created an example where there is a non-linear relationship between the number of salespeople in a company and their profit. This is because as more salespeople are added, the less effective they become. Image a very niche market that only has a certain number of customers. As you add more salespeople initially, you generate a lot more revenueSales RevenueSales revenue is the starting point of the income statement. Sales or revenue is the money earned from the company providing its goods or services, income, but at some point additional sales people run out of new people to prospect and they become dead weight for the company. The point of this model is to show an example that can’t easily be calculated using Goal SeekGoal SeekThe Goal Seek Excel function (What-if-Analysis) is a method of solving for a desired output by changing an assumption that drives it. The function uses a trial and error approach to back-solving the problem by plugging in guesses until it arrives at the answer. It is used for performing sensitivity analysis in Excel or some other solution. Learn with video instruction in CFI’s Advanced Excel Course. The Excel Solver function is located on the Data Ribbon and the keyboard shortcut on Windows is Alt, A, Y21. Once the dialog box appears you will notice several options you can work with. Set the “Objective” cell. In our case, this is Profit. Set it “To” something (Max, Min, or a specific value). In our case, we want the Max Profit. Select the Cell(s) you want to change in order to find the solution. In our case, we want to select the number of salespeople cell. Add constraints. If you want to set a constraint (e.g., a cell must be > or < some number), you can add this in. In our case, there are no constraints. Decide if you want to keep the solution in the cells or restore the original values. In this example, we’ve also shown how you could use a graph to get the solution, and this really helps illustrate the relationship between the number of salespeople and the profit of the business. Using both Excel Solver and the graph together really instills confidence in our analysis. Download the Excel file used in this example to play around with it. Try building your own from scratch too! Goal Seek only allows you to change one variable, while Solver allows you to change many at once. Solver allows you to find a Max or Min solution (optimization) while Goal Seek forces you to choose a specific outcome (not necessarily the optimal solution).